HTC Greyline™ 25 D is a single-phase dust extractor which is designed to support HTC’s single-phase grinders. The robust and sturdy construction provides a handy machine with high quality and great reliability. It is also easy to maintain and service which helps in keeping the maintenance cost at a minimum. The machine is optimized to handle dry grinding of natural stone, concrete, floor preparation and wood, but the machine is also excellent in other areas where extraction of dust is required. 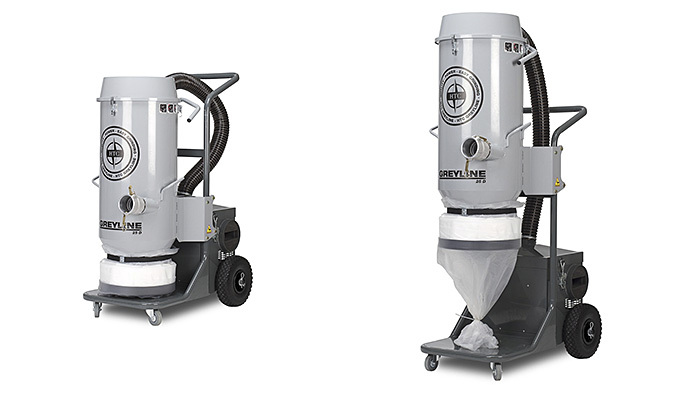 The machine use the Longopac™ system for collection of dust, resulting in very easy handling of grinding residue. The machine is also equipped with HEPA 13 filter and anti-static hoses for improved quality and safety. During transportation, to use as little space as possible, the height of the machine can be adjusted to only 1180 mm (46.5 in). The machine comes with a cleaning kit included. The Quick Guide to HTC Greyline 25 and 35 D.
To use as little space as possible during transportation the machine is easy to adjust in height. During transportation the height is only 1180 mm, or 46.6 in. The optimized construction provides a machine that is easy to maintain and to service, leading to a low maintenance cost. 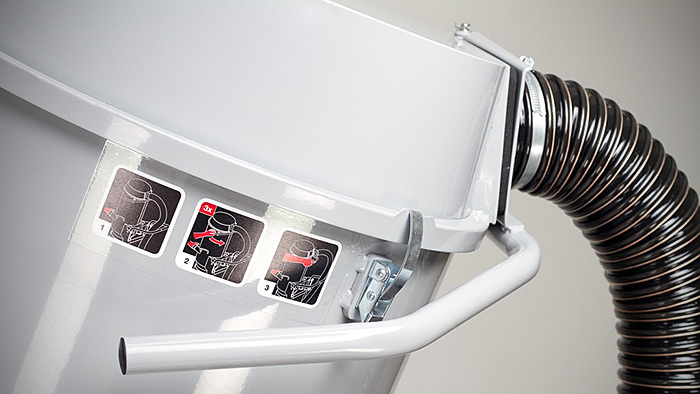 Longopac™ makes it both faster and easier to empty the grinding dust. It is also economically advantageous since 100% of the bag material is used. The vacs intelligent construction with robust and stable chassis and large rubber wheels makes them very easy to move around. HTC Greyline™ literally means easy grinding. Just connect the dust extractor with the machine and start grinding. To maintain a clean air, all HTC’s dust extractors use HEPA 13 air filters. A HEPA 13 filter must trap 99,97% of all airborne particles bigger than 0.3 microns. The HEPA filters are the most efficient air filters available.